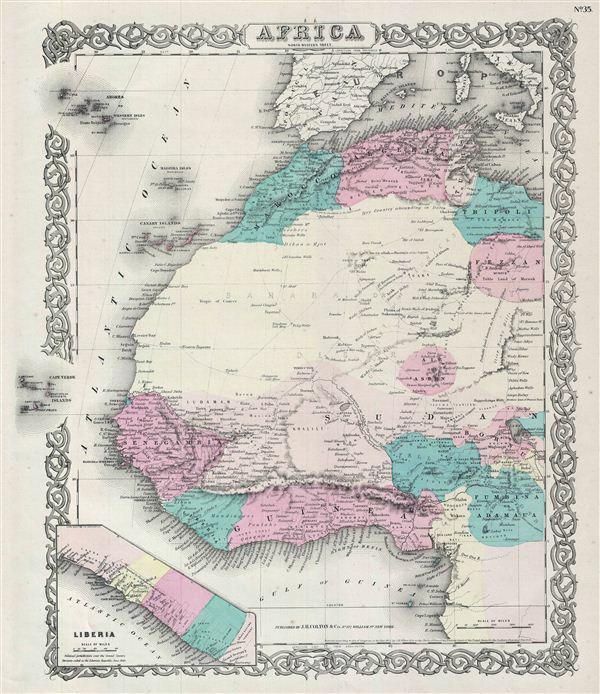 A beautiful 1855 first edition example of Colton's map of north western Africa. Like most of Colton's Africa maps, this map is derived from an earlier wall map of the world produced by Colton and D. Griffing Johnson. The map covers the entirety of north western Africa from Tripoli to Senegal and Gambia and south as far as Gabon. An inset map in the lower left depicts the Liberia land purchases of 1822 to 1848. Colton attempts to map the numerous caravan routes that crisscross the Western Sahara, noting wells, oases, towns, mines, and some topographical features. The course of the Niger is shown somewhat correctly emptying into the Gulf of Guinea. The map names numerous African tribes and nations throughout – though admittedly Colton's data is somewhat outdated. Also shows the Kingdom of Fezzan, south of Tripoli. Though mostly desert Fezzan has numerous oases and supported a relatively large population. This desert kingdom was a critical stopping point for trade caravans crossing the Sahara since antiquity. Today it has been incorporated into Lybia. This map further identifies various cities, towns, rivers, deserts, desert oases, mountains, and an assortment of additional topographical details. Surrounded by Colton's typical spiral motif border. Dated and copyrighted to J. H. Colton, 1855. Published from Colton's 172 William Street Office in New York City. Issued as page no. 35 in volume 2 of Colton's 1856 Atlas of the World. Rumsey 0149.102 (1856 edition). Phillips (Atlases) 816.